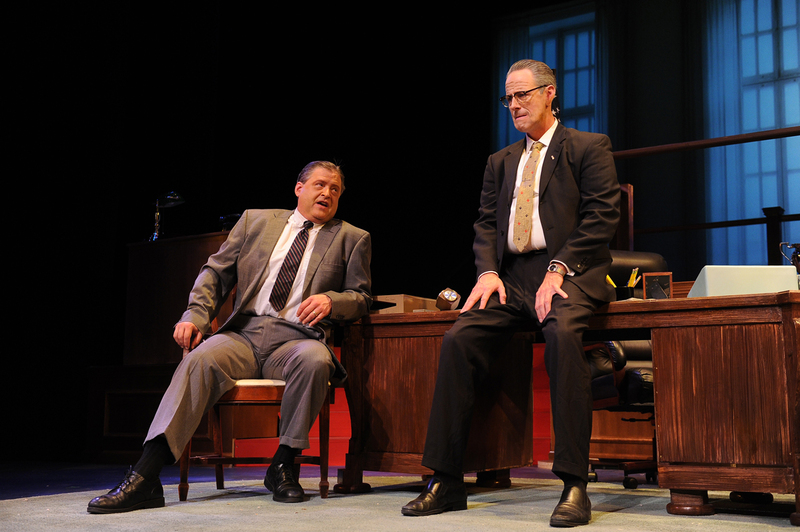 Michael Monagle as Lyndon B. Johnson, left, and Frank Gallo as Sen. Richard Russell in Palo Alto Players' "All The Way," running Nov. 2-18, 2018, at the Lucie Stern Theatre in Palo Alto. "Let us begin" proclaims LBJ (Lyndon Baines Johnson, played in a stellar performance by Michael Monagle). "No," he adds, "let us continue." It is 1963, and after JFK's assassination the vice president is now the president. 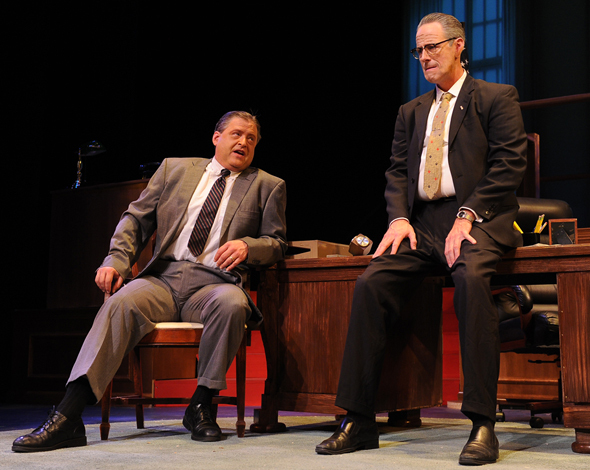 Pulitzer prize-winning playwright Robert Schenkkan's Tony Award-winning play "All The Way" gives a thrilling behind-the-velvet-ropes depiction of LBJ's first year in office as he tries and ultimately succeeds in passing the landmark Civil Rights Act of 1964. Monagle's portrayal of the "accidental president" is a masterclass in political theater and the rollercoaster ride of one man's mission to push through legislation he believes is right for the country, even at the risk of alienating his own voting base as he goes into the 1964 election. 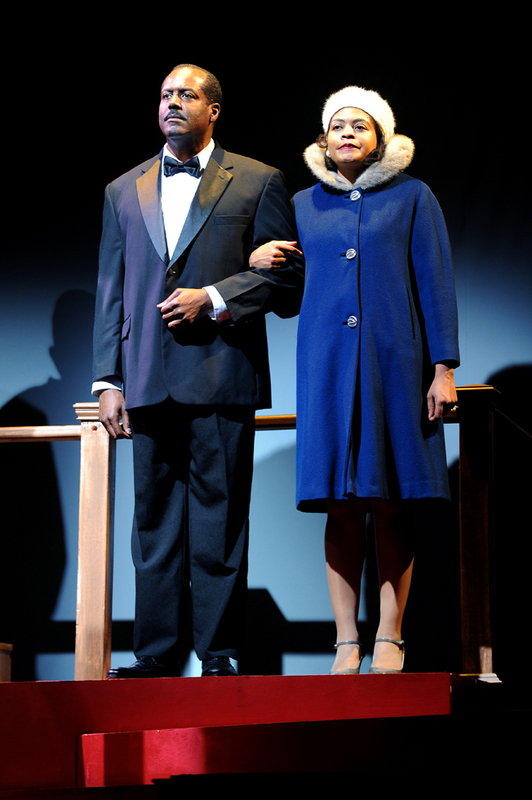 Fred Pitts as Martin Luther King Jr., left, and Shannon Turner as Coretta Scott King in "All The Way." The number of lines Monagle memorized is of biblical proportions as he packs a year's worth of intense politicking into the space of a few hours. LBJ was no slow-talking Southerner but a fast-talking, take-no-prisoners Texan who shouts, swears, cajoles, bribes, and threatens his adversaries, public and private, until he gets what he wants. Monagle can put this role down as his best to date. Two people who are both allies and adversaries are J. Edgar Hoover (Andrew Harris) and Martin Luther King (Fred Pitts). Harris has Hoover's ever-suspicious demeanor down pat, and Pitts both looks and sounds like King as he strives to keep his SCLC (Southern Christian Leadership Conference) together. 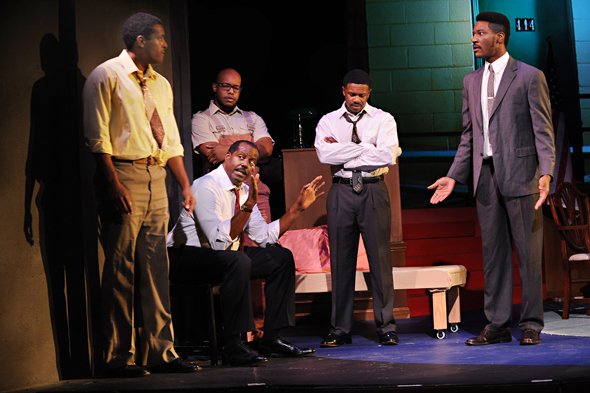 William Bryant Jr gives an impassioned performance as James Harrison/Stokely Carmichael, and Gaddy Foster's performance as Roy Wilkins/Aaron Henry at first smolders, but eventually explodes into life as their frustrations with the political process and the beatings of black marchers are kept in check by the peace-loving Dr. King. There had been a number of civil rights acts and amendments passed in the hundred years since the Civil War, but also over a hundred bills that had been voted down. LBJ has to withdraw the voting rights part of the bill if he wants to get it passed, to the anger of King and his cohorts. Johnson has to promise voting rights as a separate bill after his re-election. Shannon Turner gives an emotional and heartfelt performance as Fannie Lou Hamer, a black woman who is beaten by prison guards and – through their direction – also by prison inmates. Johnson is so focused on the bill that he believes is right for the country that he tramples over friends, enemies and even his long-suffering wife, Lady Bird Johnson, played sympathetically by Gwendolyne Wagner. She fears for his health even as he shouts her out of the room. Is he a bully or just single-minded and determined, like our own Steve Jobs? Unfortunately, he is so focused on his domestic agenda that he barely gives a passing thought to a certain incident in the Gulf of Tonkin. Fearing communist aggression, he is led by his advisors to escalate the war, a serious stain on his record which nearly wiped out the good done by the Civil Rights Act. Despite a 72-day filibuster, the Civil Rights Act of 1964 is eventually passed, even though Johnson fears that the Democrats may have lost the Southern States because of it. 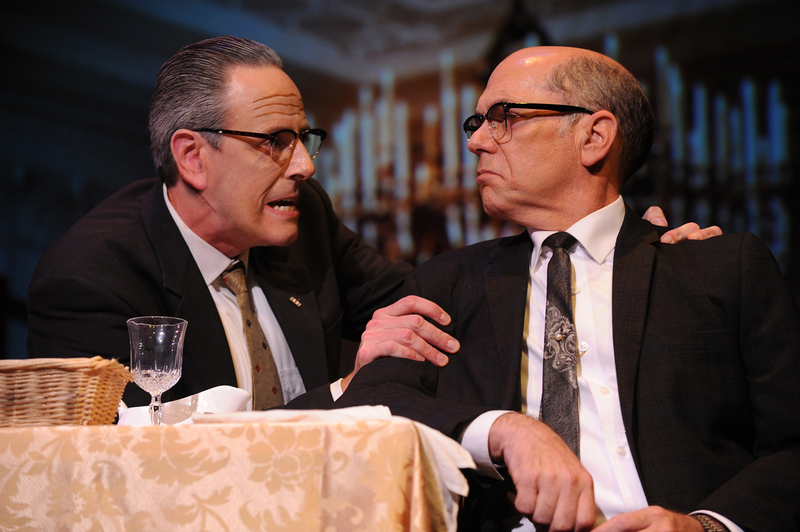 The action in the play takes place mainly in the Oval Office, with Monagle strutting around, often tethered to his desk by a telephone and a long, coiled telephone wire, as he barks orders, threats and subtle hints of blackmail. Johnson's presidency and his "War on Poverty" lifted many ordinary Americans above the poverty line, banned racial discrimination, and helped to give the vote to African Americans. Shakespeare was a master of political drama, though usually with more bloodshed. "All The Way" has plot and characters he would be proud of, and great actors to play them. William Bryant Jr. as Stokely Carmichael, Fred Pitts as Martin Luther King Jr., Remi Ferguson as Bob Moses, Stephen L. Wilson as the Rev. 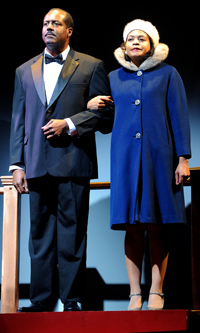 Ralph Abernathy, and Gaddy Foster as Roy Wilkins, from left, in Palo Alto Players' "All The Way," running Nov. 2-18, 2018, at the Lucie Stern Theatre in Palo Alto.